During a brief trip to Lawrence, I decided to stop and eat at “Bigg’s BBQ” , since it was voted by the KU students to be the best BBQ in Lawrence in 2010! 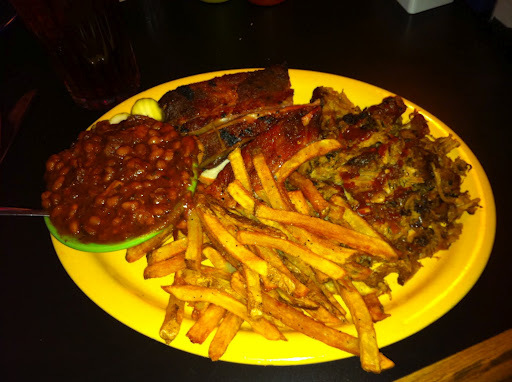 It turns out that Bigg’s BBQ is very easy to find and get to in Lawrence, as it sits on the SW corner of the intersection of Iowa Street and 23rd Street, which means if you are heading through town on either K-10 Hwy., or on U.S. 59 Hwy. 59, you will pass right by it. 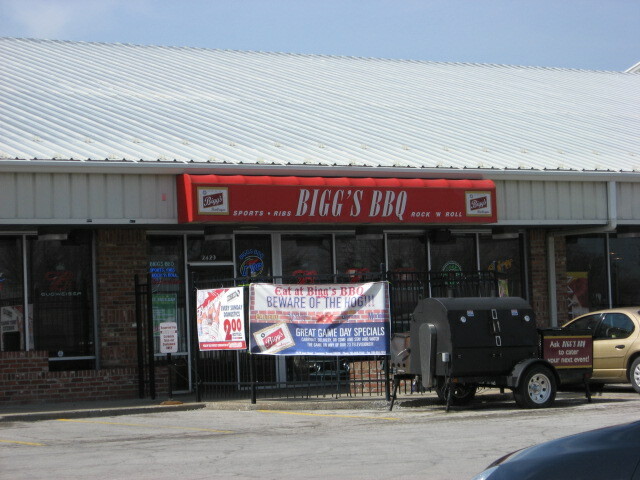 The atmosphere of Bigg’s is more like a typical sports bar, and it is located in a run-of-the-mill strip mall, so I wondered for a split second if it would be nothing but bar food with barbecue sauce on it. A short look at the menu proved otherwise, and I realized they had fully dedicated themselves to serving quality barbecue, while also making a concerted effort to have other basic “American” foods on the menu as well. I had come for the barbecue though, so I ordered the rib combo dinner, which paired 3 meaty pork rib bones with any one meat and two sides. The ribs were pretty good, except they were a little dry for my taste. The dry rub was really good, they were not fatty, and there was a good amount of meat on each bone. I had pulled pork for my other meat, and found it to be very tender and smoky. It too was perhaps a little dry, but there was a lot of it on the plate, and with some sauce, I found it to be very good. Speaking of the sauce, they had three different “Kansas City Style” sauces to choose from (regular, hot, and sweet) that were all really good I thought. The beans were delicious, as there was meat in every bite of beans it seemed, and the fries were excellent too! Considering the way most BBQ places cook and prepare their meats, I thought later that choosing a Wednesday at lunch was maybe not the best time of the week to get the greatest impression of Bigg’s BBQ. Knowing this, I plan to go back one of these days during a peak dining time to try it again, but in the meantime, I would wholeheartedly recommend it as a good place to stop and eat if you are in Lawrence and want some barbecue. When a place offers up appetizers such as “pulled pork nachos” and “pulled pork quesadillas” on top of their usual BBQ plates, I know there’s no way you’re leaving that place hungry! We’re going to change things up a little bit this week and not have a giveaway, but we are going to give our readers something cool. Click here to sign up to receive a $1 off pork coupon by mail. By signing up you will also register for other special pork giveaways and coupons year round. The coupons can be used at any grocery store in the U.S. for things like chops, loins, tenderloins or ribs. Moreover, it’s sure to provide a lot of pork love for you and your family.